Notorious Sicilian Mafia "boss of all bosses" Salvatore "Toto" Riina has died from cancer in jail, aged 87. 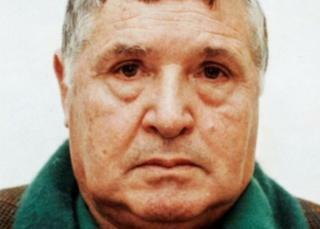 The head of the feared Cosa Nostra spent nearly a quarter of a century on the run before being jailed in 1993. He ordered more murders from jail. As well as kidney cancer, he was said to have been suffering from a heart condition and Parkinson's disease. Riina had been in a medically induced coma and his family had been given special permission to visit him in the prisoners' wing of the hospital in Parma, northern Italy. How did Riina become the 'boss of bosses'? Riina was born in 1930 to poor farmers in Corleone, Sicily - the birthplace of Don Corleone, the fictional Godfather in Francis Ford Coppola's film trilogy. His father was killed when he was 13 and at 19 he joined the local Mafia, committing murder to gain entry. He spent six years in prison. When he got out, he helped local mobster Luciano Leggio kill Corleone's Mafia boss. Along with childhood friend Bernardo Provenzano, he then led a hit squad targeting Mafia boss Michele "the Cobra" Cavataio in Palermo, giving the Corleone clan a foothold in the Sicilian capital. When Leggio was arrested in 1974, Riina became boss. Under his leadership, the clan came to dominate the Cosa Nostra crime group in the 1970s, as its fortunes blossomed, buoyed by a booming trade trafficking heroin to North America. He was a wanted man, but evaded justice for 24 years, remaining all the while on the island of Sicily. The Mafia is notorious for brutality, but Riina was the most savage of all, earning him the nickname "The Beast". "He was the fiercest and the nastiest mobster in the mafia probably in history," Francesco Bongarra, a journalist with Italian news agency Ansa, told the BBC. While his cruelty propelled him up the ranks it was also key to his downfall, and to a pivotal point in Mafia relations with the Italian state. In 1981, Riina began a two-year drive dubbed "The Slaughter" to eliminate his rivals, causing many mobsters to fear for their own lives and those of their families. Many broke their code of silence and began to co-operate with investigators, resulting in a breakthrough case which saw hundreds of mafiosos convicted. Riina did not take this lying down. In 1992, within two months the two leading judges in the case, Giovanni Falcone and Paolo Borsellino, had been blown up. But six months later, Riina was arrested. What has happened since his incarceration? In detention, Riina's savagery continued. He ordered the murder of a 13-year-old boy kidnapped to try to prevent his father revealing information about the Mafia. The boy was strangled and his body dissolved in acid. Riina had been imprisoned under the "Article 41-bis prison regime" imposing tight security measures on Mafiosos intended to completely cut off prisoners from their criminal contacts. Image caption In his final days in jail, Riina was recorded saying he "regrets nothing"
The regime includes strictly limited visits from his family. Petitions for him to be released into house arrest for his last days were met with angry protests from the relatives of some of his many victims. Earlier this year, Riina was recorded on a wiretap saying he "regrets nothing... They'll never break me, even if they give me 3,000 years" in jail, reported AFP news agency. And indeed he has never broken his silence. Riina leaves behind a wife, Antonietta, and four children, including his eldest son, Giovanni, who is serving a life sentence in jail for four murders.